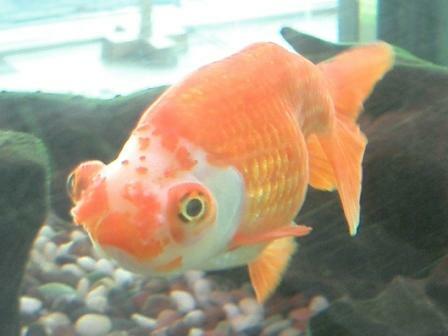 Background Goldfish which have nasal bouquets (exaggerated tufted nasal septa) are generally called the Hanafusa (Pom Pom), a native Chinese goldfish. It is not known how it came to exist. Because its nasal bouquet is similar to flowers, this goldfish has earned the elegant name ‘Hanafusa’ (meaning ‘flower cluster’) in Japanese. There are also other kinds of goldfish which have nasal bouquets. The nasal bouquets on their nose is the Pom Pom’s greatest feature. The Ranchu type of Pom Pom without a dorsal fin is called the Chinese Pom Pom, and the Oranda type of Pom Pom with a dorsal fin is called the Japanese Pom Pom. The Oranda type of Pom Pom was produced in the Ise district of Japan, called the Ise Pom Pom, until 1987. In order to distinguish between the two varieties of Japanese-bred Pom Poms, those with a dorsal fin are called the Japanese Pom Pom. Currently, both Pom Poms are imported from China. Acquisition difficulties Difficult. Since there is less demand for this goldfish, distribution amounts are low. It is difficult to acquire. Normal. As long as basic rearing rules are followed, there are no particular challenges. The Pom Pom in the photo is the goldfish displayed at Goldfish Hall, Nagasu, Kumamoto Prefecture (a goldfish breeding district in Kyushu). It is the Ranchu type of Chinese Pom Pom without a dorsal fin. Its developed nasal bouquets are cute and charming. It is named ‘Pom Pom’ in English. This cute name expresses how pretty the ‘pompom’ is on its nose.